It’s genuinely new, different and fun: setting up a perfect kill zone of crossfire feels deliciously evil. You’re given a moment’s notice of the arcs the next deluge of foes will trace, so you’re always thinking ahead. But strangely, this is also what stops Legions from being great. It certainly adds strategy, having to interpret these scribbling lines, picture what they represent, conceive of a tactical plan and place your turrets accordingly. But it’s a constant interruption to the electric primal fun of dodging hazards and shooting furiously. 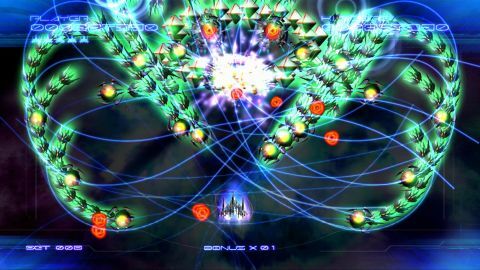 The joy of shoot-’em-ups is The Zone: that trance in which you become the ship, reacting on instinct at a pace rational thought can’t hope to match. In Galaga Legions, it never happens. Every five seconds you’ve got to snap out of it and fret about where to put your turrets. Legions only has five stages, tough enough for real rookies. Your 800 points buys you a nice new idea, some extraordinary and quite beautiful shoals of enemies, and a handful of “Ha!” moments when you set the perfect trap. For that, it’s worth it. Description Your 800 points buys you a nice new idea, some extraordinary and quite beautiful shoals of enemies, and a handful of "Ha!" moments when you set the perfect trap. For that, it's worth it, but be warned that its resemblance to Galaga is tenuous enough to warrant a paternity test.